Fancy getting involved in something fun, sociable which also has health benefits…? What’s not to like! Sport can be intimidating for women… we can find it daunting, we shy away from it – but we shouldn’t, we need to find ways in which we can get involved and enjoy it – have fun. The World Cancer Research Fund concluded that there is strong evidence that physical activity protects against cancers of the colon, breast and endometrium, and that it helps prevent excess weight gain. However in recent years alternative versions of the game have been developed to make this sport more accessible to women of all ages and abilities. 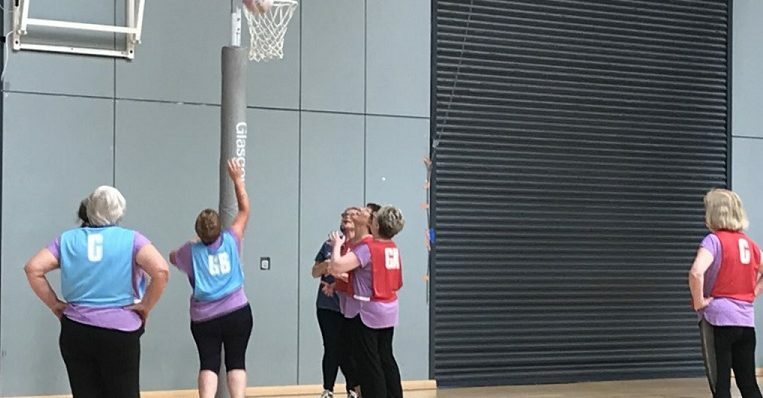 Bounce-back to netball and walking netball are where the sport is really growing and women across Scotland are getting involved, having lots of fun and seeing the benefits. In the summer of 2017, Netball Scotland joined forces with Age Scotland to Launch Walking netball Across Scotland. Walking netball is suitable for all ages, abilities and fitness levels. It is just like netball but it is played at a slower (walking) pace on a smaller court – but with just as much fun. And if you’ve never played before it doesn’t matter – you will quickly learn all the basics. Bounce back to netball is suitable for women over the age of 18 years, for those who haven’t played before or those that haven’t played for many years. After perfecting the basics, fun games are often set-up between different bounce-back teams – again it is all about having fun whilst being active.